Perpetual Motion has been my nemesis. For a while I thought that this could be the piece that I just would never be able to play, and that it would mark the time when I might was well give up playing. Was moving along reasonably well through Suzuki book 1 (not as quickly as some here have done, but making progress nonetheless), and then I came to Perpetual Motion. It has been a difficult piece for me to master, in large part because of the extensive use of 4th finger. With a short pinky and some arthritis in the left hand, 4th finger is not easy for me to reach. I am using a 7/8 violin, which is definitely more comfortable than the 4/4 I was using when I first started. Right now I am having lessons once a month. I first played the piece for my teacher at my September lesson, and at that time I had not been playing it regularly for long. After then, I played it a lot, and it was much better at my October lesson. But it is still not really that great. I thought it was getting better, but after hearing this recording I can hear that it does not sound as good as it does under my ear. I have my November lesson this week and would like to be able to show better progress. Any suggestions and ideas would be appreciated. Thanks! Try and intonate each proceeding note BEFORE you change directions of the bow. This will increase your music speed and simultaneously get your music to blend together. Actually here is one more suggestion. Your bowing arm needs improvrment. You're currently bowing with your shoulder when you should instead be bowing with your elbow. The two sections of your arm should create acute and obtuse angles. This way, each bow directional transition will be smoother as you use your wrist to negotiate those directional changes. Thanks, Jacques! Will work on those during practice tonight. The bowing elbow versus shoulder has been difficult for me to get. I usually dedicate a portion of each practice to trying to minimize shoulder motion while doing a legato piece like Lightly Row or Long Long Ago. But then when I try another piece - especially a more staccato piece - the shoulder motion comes right back! Okay, try and levitate your shoulder/deltoid up - this may help you to engage your bicep and tricep so that those muscles can be more responsive for your bowing. Be relaxed but not comfortable, I suppose. Don't clinch the shoulder up like your bracing for a punch, but rather a happy medium of muscular engagement so that you may together: operate the bicep and the tricep to create those acute and obtuse angles. Engage one one muscle to help engage the others! Just an observation you bow grip seems to be very tense your pinky is curled the opposite way it should curl and your fingers appear to be spread apart not close together I know I have an issue with tension in my bow grip an found my pinky was causing a lot of my problems also try playing with your elbow against a wall or door jam to help keep it still on let the elbow open up more. Jacques - Those extra details are helpful for trying to piece together the proper motions. Thank you! You must have been a silent observer at my last couple of lessons! At each one, my teacher has spent about half of the time going over bow hold. I guess it is still not sinking in... She suggested a "send Pinky to the gym" bow exercise, which I have been doing but should probably be doing even more. Tonight I spent about half of my practice time really concentrating on the bow hold and bowing motion while doing scales and simple songs like Twinkle and Lightly Row. I guess I need to keep doing that until the proper bow hold and motions become more automatic rather than something I have to really concentrate on. Those are some great tips! I know everyone is different, but what helped me is doing the bowing movement in front of the mirror, even without the bow. Having that aspect really helped me separate the movement from shoulder to lower arm. Maybe it's the brain that needed to be tricked. I've been using the mirror too, once I have a piece practiced enough to play by memory or ear. At this point I still have to look at my fingers when I am learning a piece to make sure I am hitting the finger tapes! 2. imaging your upper arm is the wall, your elbow is the hinge, your lower arm is the door that opens and closes. 3. practice long/full bow strokes and watch your bow on the strings while keeping an eye on how your wrist, lower arm, and upper arm work together to keep your bow straight. 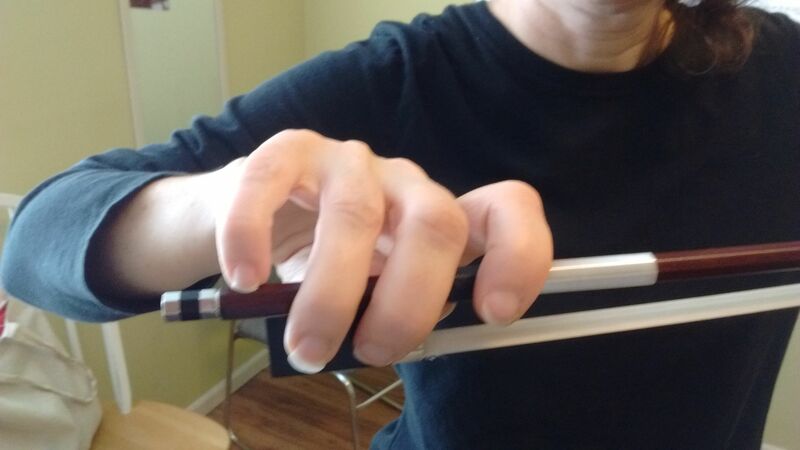 4. use a toilet paper tube, hold it with your violin hand and position it on your left shoulder, put your bow in the tube and begin your each practice with this. While bowing, watch how your lower arm opens and closes, and watch your wrist movements - how it helps keep your bow straight. When you get your bow arm right, the doubles in perpetual motion will come easy. Great tips - thanks! My son did the whisper tube thing as part of his early lessons, but I never thought to try that myself. He is lucky not to have to un-learn bad habits as I am doing now! Okay, so I had my violin lesson last week. We ended up spending most of the lesson on bow hold and flowing bow motion, with me just playing scales and Twinkle. I asked my teacher to take pictures of my bow hold once my hand was in the correct position, and it has been very helpful to have these available for reference. An example is attached to this post. I realize that there are other valid ways to hold a bow, but this is the way I am trying to learn it. So after all the bow hold and bow motion work, there was only time for me to play one of my recently assigned pieces. She asked for Andantino, which I have been working on since the October lesson. So I ended up not playing Perpetual Motion for her this time! At the end of the lesson, she suggested that I concentrate on scales and the very early Suzuki pieces (i.e., through Song of the Wind) and spend most of my practice time just focusing on holding the bow and making more relaxed, flowing bowing motions. Not necessarily what I wanted to hear, when there are so many tempting pieces to play! But, I have been taking her advice, and I believe it is slowly working. I've been spending about half of my practice time in this way, about a quarter of the time with the recently assigned Suzuki pieces (Perpetual Motion, Allegro, and Andantino), and the remaining quarter of the time with simple holiday tunes like Jingle Bells, I Have a Little Dreidel, Joy to the World, and Jolly Old St. Nicolas. The holiday tunes are ones my son is doing with his group for their holiday performance, and I am basically using the tunes as additional pieces for bow hold and bow motion practice so I don't get too sick of Lightly Row! That bow hold certainly looks more natural and relaxed. I had a hard time with my hold as well. Also, to help minimize your shoulder movements try focus a few minutes on your bow strokes alone. I've read and saw an awesome video by Mark O'Connor where the bow stroke makes the fiddler stand out. Post us a re-do on this after a few more weeks. You may be surprised how far you can progress when focused. Thanks, @Ripton . It will be a slow process. The last couple of days I thought my bowing was improving a lot. I check (and adjust if necessary) bow hold before every piece. When I looked in the mirror while playing, it seemed to be mostly elbow motion with little or no shoulder involvement. But then last night I made another video, and on the video it looked like the motion was all shoulder with the elbows locked into a position! So I guess the proper motion is still happening only when I specifically concentrate on that. As soon as I think about anything else, I revert back to shoulder motion. @Fidelestre, that's a picture perfect bow hold. Great photo.. thanks for sharing. Something that helped me - a suggestion from my Suzuki Teach was placing a rice pack [one that people heat up and put on their neck] or anything to put weight on my shoulder. I had long bows but she had me do short bowing until I got my shoulder under control. Just shows you how different people and their bodies are. I have to pull my shoulder down as though I have a weight hanging from my elbow!! I have trouble raising my elbow so it stays down closer to my body which means I really need that wrist action. She does great talk/walk/play through videos for most of the book that are great resources when you're having trouble with a particular piece. Heartbreak alert, she doesn't do EVERY piece!